Dogg Pound Rapper Dangerous Rob's style adds a lighter touch to gangsta rap yet still keeps the brutal honesty gangsta rap is famous for. His twenty years of old school rap experience shines through in this ground breaking CD. Robert C. Daniels has been in the record industry for 20 years. He recorded his first rap record at the age of 15 with a group named THOB-MOB. After graduating from Edison High School in Tulsa, Oklahoma in 1989, Dangerous Rob went to Langston University in Oklahoma. There he performed in talent shows and rap contests. In 1990 he put his educational goals aside and released his second record. Combined with Partners-N-Rhyme a local rap group, the record was distributed nationwide. It sold more than 10,000 copies of the single "Cold Chillin in the Middle". This popularity allowed him to perform with many big named artists. In 1995 Dangerous Rob released Bakkk From the Middle which sold over 6,000 copies. "It's a T-Town thing" is a cut that best represents the positive direction that his 'middlism' style is taking him. 'Middleism' is a style that adds a lighter touch to gangsta rap yet still keeps the brutal honesty gangsta rap is famous for. In 1999 Dangerous Rob released At Tha Bank which gained nationwide attention when Murder Dog Magazine rated it the 8th Best Independent Rap CD in the country. In 2001, Dangerous Rob was nominated for a Spotnik award for best hip hop/rap artist. He would be nominated two more times in 2004 and 2005. The Spotnik Awards are presented to local musicians by the Tulsa World. In 2003 D-Rob released "Grind Til-U-Shine". Reinforcing himself as the premier hip-hop artist in the midwest. 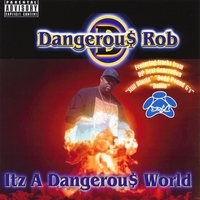 In 2005, Dangerous Rob released, "Dangerous On Arrival" and "S.I.S.T.A." his greatest hits album. In 2006, Dangerous Rob became a member of the legendary Dogg Pound with the endorsement of Daz Dillinger and Kurupt. Dangerous Rob also released "Comin From Da Thugg" a mixtape with Brok Bundlez. The year of 2007 should be exciting with the upcoming release of "It'z A Dangerous World" plus Dangerous Rob takes FREEDAM Records up to the big leagues. Rob manages his own label F.R.E.E.D.A.M. Records and still produces different acts in the city of Tulsa.